Russia is keeping pace with the U.S. in the field of long-range precision tactical weaponry, and in some areas it even has an advantage. The Tactical Missiles Corporation, which unites all Russian producers of tactical and precision tactical missiles, has issued about ten new products in the last 2-3 years, including long-range missiles. RBTH presents three main new missiles that will be employed by the Russian armed forces starting 2015. 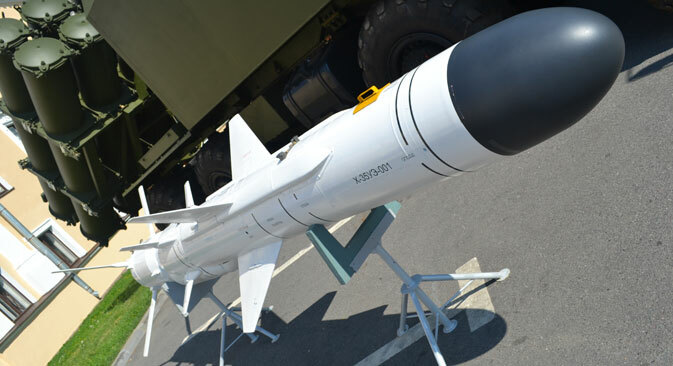 Russia’s principal new defense product is the winged KH-35U Uran missile. Its special feature is its unique self-guided head, which is immune to enemy radar interference. It works in two modes: active, when the missile turns on its guiding head for a split second to find the target, and passive, when it does not scan the space around it to detect the target, but merely perceives the impulses emitted by the target. The Americans were very interested in this characteristic and wanted to purchase KH-35U self-guided missile heads for their Harpoon anti-ship missiles. The KH-35U attacks the target at the height of almost three meters above sea level - lower than the ship's deck, which makes detecting it difficult for radar stations. Considering that all anti-aircraft systems work in the upper hemisphere, even if the KH-35U is detected, shooting it down is still not easy. Such missiles can be placed on surface ships and in SSC-6 shore missile complexes. This system consists of two commanding machines, four launching installations, each equipped with eight batteries of missiles, and four transport loaders equipped with 32 secondary discharge missiles. It only takes minutes to deploy the complex – which is capable of covering 220 miles of shoreline - and for it to find and hit its target. No anti-aircraft system today is capable of intercepting the 32 low-flying winged missiles. Another novelty is the improved version of the KH-31PM, a missile that is already very well known in the U.S. Navy. The KH-31 was a missile that the American fleet bought from Russia in the 1990s as a target missile for developing ships' anti-aircraft systems. The Americans used the KH-31PM to learn how to hit the Chinese 3M-54 Moskit anti-ship missiles, which had been produced by Russia. In the West the Moskit is codenamed “Sunburn”, due to its speed of over 1,700 mph and its all-destructive potential: No warship is currently capable of evading this missile. The KH-31, which is very similar to the Moskit, is smaller and cheaper and is used for destroying above-water targets, radar stations and anti-aircraft missile complexes such as the Patriot. It can be installed in all types of Russian destroyers and bombers. The new KH-31PM has an increased range of 160 miles. It also has a new guidance system and engine, which make its flight more unpredictable and deadlier for the adversary. For example, the missile is equipped with the broadband guidance head, which can be used against practically all anti-aircraft systems. The earlier missiles were equipped with selective heads, which could only be used against one type of system. Perhaps the most impressive system is the winged 3M-55 Yakhont missile, which was used as a model for the Russian-Indian BraMos missile. The peculiarity of these missiles is their artificial intellect, which is comparable to that of the human, helping it function against a single ship on a "one missile-one ship" basis, or as a "flock" against a squadron of ships. The missiles distribute and classify the targets according to their significance, choose an attack strategy and the plan of its realization. In order to exclude errors in selecting the maneuver and striking the assigned target, electronic "portraits" of all modern types of ships are installed in the anti-ship missile's onboard computing machine. These are not only the dimensions and contours of the ship, but also data on the various electromagnetic and other force fields inherent only to this type of ship. The machine also has purely tactical data, such as data on the type of ship squadron, which helps the missile determine what is in front of it - aviation carriers or an amphibious group - and attack the target. The onboard computing machine also has data on countering the adversary's electronic combat resources, which can interfere and lead the missiles away from the target, as well as tactical techniques of evading anti-aircraft defense fire. The constructors say that after being launched, the missiles decide themselves which one will attack the target and which one will only imitate the attack, distracting the adversary's anti-aircraft systems. When one missile destroys the principal target in the squadron, the remaining missiles attack the other ships, excluding the possibility of striking one target with two missiles.